St Michaels' Church hosted Shap's Royal Wedding on 24 May 2018. 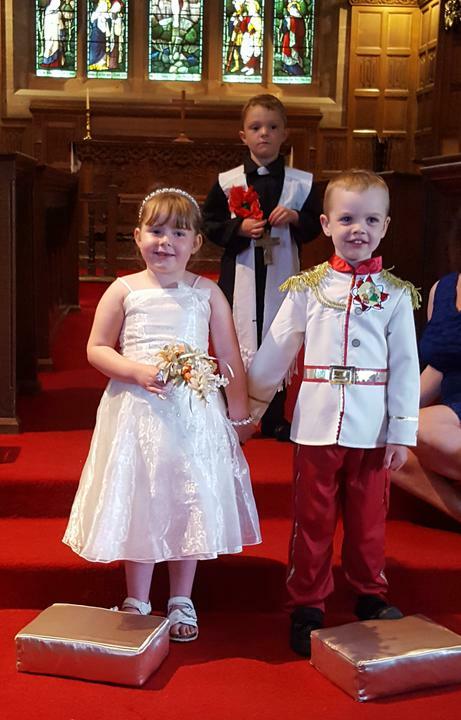 After weeks of preparation (writing invites, creating button holes and cake making to name but a few jobs on the list) Prince Harry (Harrison) and Meghan (Eden) were happily married by the Vicar (Seb) of Shap's Church. Bride, Groom and guests were dressed to impress in their finest gear - fit for royalty! The aisle was decorated in balloons of the Queen's favourite colours, and the cakes were expertly designed and created by Catbells Class! Music included Circle of Life and Give Me Joy in my Heart, and the prayer was written and read by our Vicar (Seb) after a chorus of God Save the Queen. The service concluded with a toast to the Bride and Groom with 'special strawberry punch' (the mocktail variety). Rev. Alun Hird, a guest at the wedding thoroughly enjoyed the occasion, he was particularly impressed by 'our vicar', questioning him as to his availability for future services! Thank you ever so much to parents for their help and support, and a special thanks to Elizabeth Grose for opening up church, and helping to sweep up the wedding cake crumbs... MUCH APPRECIATED!